In this activity, you will demonstrate different kinds of sorting methods on your own students. This is an unplugged activity, so your students will be standing at the front of the room. If you or your students are curious to see what these different sorts look like in code, we have included a MakeCode version of each algorithm in this lesson, for you to explore if you choose. Have up to ten students (the Sortees) stand up at the front of the classroom. Ask another student to volunteer to be the Sorter. Mix up the order of the papers and give each student a piece of paper with a number on it. They should hold the paper facing outward so their number is visible. Each of these students is like an element in an array. Ask the Sorter to place the students in order by directing them to move, one at a time, to the proper place. How did she sort you into the right order? First, she went to the first student, then put him in the right place. Then she went to each of the next students and put them in the right place. Ask for clarification when necessary: What does it mean when you say “put them in the right place”? Bring the person to the front of the line and then compare that person’s number with the first person’s number. If it’s larger, then move that person to the right. K eep doing this as long as the person’s number is larger than the person on the right. In computer science, there are certain common strategies, or algorithms, for sorting a collection of values. Try acting out each of these different sorts with your students. Compare the first two students. If the student on the right is smaller than the student on the left, they should swap places. Then compare the second and third students. If the student on the right is smaller than the student on the left, they should swap places. When you reach the end, start over at the beginning again. Continue in this way until you make it through the entire row of students without swapping anybody. Create a variable called counter. Go through the entire array. Repeat steps 2 through 4 as long as counter is greater than zero. Note: Press B to display the array visually. The length of each vertical bar represents each number in the array, from left to right. Press A to sort the array using Bubble Sort. Press A + B to generate new random numbers for the array. Take the first student on the left and consider that person’s number the smallest number you have found so far. 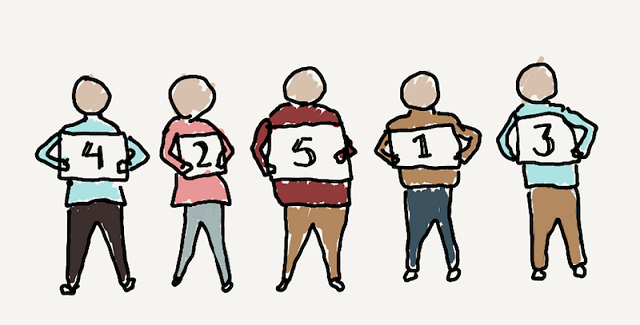 If the next person in line has a number that is smaller than that number, then make that person’s number your new smallest number and continue in this way until you reach the end of the line of students. Then, move the person with the smallest number all the way to the left. Then start over from the second person in line. Keep going, finding the smallest number each time, and making that person the rightmost person in the sorted line of students. Find the smallest unsorted value in the array. Swap that value with the first unsorted value in the array. Repeat steps 1 and 2 while the number of unsorted items is greater than zero. Note: The inner loop gets smaller as the sorting algorithm runs because the number of unsorted items decreases as you go. The index that the inner loop starts at needs to change as the number of sorted items increases, which is why we have to use a separate counter (item) and compute j every time through the inner loop. Take the first student on the left and consider that person sorted. Next, take the next student and compare him to the first student in the sorted section. If he is greater than the first student, then place him to the right of the student in the sorted section. Otherwise, place him to the left of the student in the sorted section. Continue down the line, considering each student in turn and then moving from left to right along the students in the sorted section until you find the proper place for each student to go, shifting the other students to the right to make room. For each element in the unsorted section of the list, compare it against each element in the sorted section of the list until you find its proper place. Shift the other elements in the sorted list to the right to make room. Insert the element into its proper place in the sorted list.